A federal judge’s rebuke of the controversial Council on American-Islamic Relations supports claims that the Muslim lobby group is abusing the court system in an attempt to silence opposition, says a lawyer for defendants in the case. CAIR, which was tied to a major terrorist-financing scheme, “has a long history of filing lawsuits that cost millions of dollars to its victims,” Daniel Horowitz told WND. “It is the same tactic that Scientology and other groups have used,” he noted. 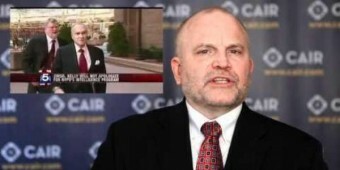 CAIR filed suit in 2009 against former federal investigator Dave Gaubatz and his son, Chris Gabatz, after the two carried out an undercover investigation of the Islamic group. The Center for Security Policy in Washington, D.C., and three of its employees were later added to the suit for their part in commissioning a documentary. Evidence from the investigation was published in the WND Books expose “Muslim Mafia: Inside the Secret Underworld That’s Conspiring to Islamize America.” The book documents CAIR’s support of radical jihad, recounting its origin as a front group for the Palestinian terrorist group Hamas and the Muslim Brotherhood, the worldwide movement that has stated its intent to transform the U.S. into a Saudi-style Islamic state. CAIR alleges it suffered damage after the younger Gaubatz, posing as an intern, obtained access to some 12,000 pages of CAIR internal documents under false pretenses and made recordings of officials and employees without consent. On Friday, federal Judge Colleen Kollar-Kotelly of the U.S. District Court for the District of Columbia denied CAIR’s motion to extend discovery of the Center for Security Policy and several of its employees. The court agreed with a brief by the American Freedom Law Center, which is defending CSP, and will soon set a schedule for motions that could end the case. “We are looking forward to trial so that this attack on the First Amendment can be ended,” he said. Horowitz said the “glaring weakness” in CAIR’s case has always been a lack of damages. If they sued for this, the judge would throw the case out of court,” he explained. ‘Instead, it is suing for minor points that caused no harm.”“CAIR can’t sue for being exposed for its Muslim Brotherhood and Hamas founding. That is what ‘Muslim Mafia’ was about,” he said. Horowitz pointed out that in a complaint by talk-host Michael Savage against CAIR several years ago, his team prepared a RICO complaint that alleged the Muslim group was engaging in a deliberate tactic to silence opposition. Kollar-Kotelly also denied CAIR’s request to depose two non-party witnesses in the case, ruling the request was untimely, without cause, and would disrupt the court’s management of its schedule and prejudice defendants by delaying resolution of the case. The court said even CAIR’s motion seeking more time for discovery was itself untimely and substantively deficient. “Indeed, this misrepresentation is just a part of CAIR’s pattern of taking a troubling and seemingly abusive approach to civil litigation,” he said. In its motion to extend the discovery period, which had been ongoing for more than 13 months, CAIR requested to depose “Muslim Mafia” co-author Paul Sperry. In the lawsuit, CAIR, a self-described Muslim civil-rights group, does not defend itself against the book’s claims, and the FBI seized the CAIR material from the Washington law office of one of the Gaubtazes’ three high-profile lawyers. A previous filing in the case revealed a federal grand jury is investigating CAIR for possible violation of laws that ban financial dealings with terrorist groups or countries under U.S. sanctions. In her opinion in June 2011, Judge Kollar-Kotelly granted part of the Gaubatzes’ motion to dismiss the case, throwing out the count pertaining to the audio and video recordings but maintaining other counts, including theft of physical documents. As WND reported, CAIR’s complaint seeks to expunge all copies of “Muslim Mafia,” in an attempt, according to Horowitz, to eliminate evidence that could lead to criminal prosecution of the group. Muthanna al-Hanooti: The CAIR director’s home was raided in 2006 by FBI agents in connection with an active terrorism investigation. Agents also searched the offices of his advocacy group, Focus on Advocacy and Advancement of International Relations, which al-Hanooti operates out of Dearborn, Mich., and Washington, D.C.Al-Hanooti, who emigrated to the U.S. from Iraq, formerly helped run a suspected Hamas terror front called LIFE for Relief and Development. Its Michigan offices also were raided in September 2006. In 2004, LIFE’s Baghdad office was raided by U.S. troops, who seized files and computers. Al-Hanooti is related to Sheik Mohammed al-Hanooti, an unindicted co-conspirator in the 1993 World Trade Center bombing. Laura Jaghlit: A civil-rights coordinator for CAIR, her Washington-area home was raided by federal agents after 9/11 as part of an investigation into terrorist financing, money laundering and tax fraud. Her husband Mohammed Jaghlit, a key leader in the Saudi-backed SAAR network, is a target of the still-active probe.Jaghlit sent two letters accompanying donations – one for $10,000, the other for $5,000 – from the SAAR Foundation to Sami al-Arian, now a convicted terrorist. In each letter, according to a federal affidavit, “Jaghlit instructed al-Arian not to disclose the contribution publicly or to the media.”Investigators suspect the funds were intended for Palestinian terrorists via a U.S. front called WISE, which at the time employed an official who personally delivered a satellite phone battery to Osama bin Laden. The same official also worked for Jaghlit’s group.In addition, Jaghlit donated a total of $37,200 to the Holy Land Foundation, which prosecutors say is a Hamas front. Jaghlit subsequently was named an unindicted co-conspirator in the case. Nihad Awad: Wiretap evidence from the Holy Land case puts CAIR’s executive director at the Philadelphia meeting of Hamas leaders and activists in 1993 that was secretly recorded by the FBI. Participants hatched a plot to disguise payments to Hamas terrorists as charitable giving.During the meeting, according to FBI transcripts, Awad was recorded discussing the propaganda effort. He mentions Ghassan Dahduli, whom he worked with at the time at the Islamic Association for Palestine, another Hamas front. Both were IAP officers. Dahduli’s name also was listed in the address book of bin Laden’s personal secretary, Wadi al-Hage, who is serving a life sentence in prison for his role in the U.S. embassy bombings. Dahduli, an ethnic-Palestinian like Awad, was deported to Jordan after 9/11 for refusing to cooperate in the terror investigation. (An April 28, 2009, letter from FBI assistant director Richard C. Powers to Sen. Jon Kyl, R-Ariz. – which singles out CAIR chief Awad for suspicion – explains how the group’s many Hamas connections caused the FBI to sever ties with CAIR. )Awad’s and Dahduli’s phone numbers are listed in a Muslim Brotherhood document seized by federal investigators revealing “important phone numbers” for the “Palestine Section” of the Brotherhood in America. The court exhibit showed Hamas fugitive Mousa Abu Marzook listed on the same page with Awad.